I just love this coffee maker. It brews hot coffee easy and fast one cup at a time. I was using a Keurig but it broke and I didn't want to buy another expensive one. So my daughter had this one. I bought one and it does, both pods and ground coffee. So now I have the best of both kinds of coffee. I like to have a hot cup of Joe every morning when i get up. Unfortunately a whole pot of coffee gets waisted unless its that occasional day that my husband decides to have a cup. With the Hamilton Beach The Scoop, i can have my cup and its ready in about 4 minutes. That includes putting in tbe water, the coffee, and brew time. You can adjust how much you want up to 14 ounces. Its quick,easy,and hot. This coffee maker is great. No need to use those plastic pods that stay in landfills forever. Also I use less water & coffee than my drip coffee pot. It took a bit to adjust the amount of coffee to use and which brew setting we liked best. It does a great job for both 8oz cups and travel mugs. Had to design my own stand for a 12 mug I use regularly. I love the tall spout on this because I can brew a carafe. This machine is simple and inexpensive but it works just as well as some of my expensive brewers I've owned. 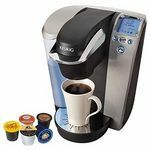 The machine is tall which works out great for me because I can actually put a carafe or pitcher under the spout and brew a large container of coffee or tea. I love that I can brew tea in this machine as well because I frequently have a carafe of raspberry or lemon or other type of herbal tea on my table. It's nice being able to have coffee, tea, or cocoa in a small cup or large container. Brew Performance This machine does brew a little slower but I don't mind. It brews well and I haven't had any issues with it. I can brew coffee, tea, or cocoa in this machine without issues. Ease of Cleaning This machine is easy to clean because of the design. I can't take it apart or put it in the sink but because it is so simple, I dont have to spend a lot of time taking a brush to it or taking it apart to wipe it down. Ease of Use This is so simple to use. I can set it and forget it, truly. Design I am a fan of the design of this because it allows me to brew a single cup or set a large canister under the spigot and brew a larger container full of tea or coffee without dirtying up a transfer container. Durability I haven't had any issues with this machine so far. It seems as if it is fairly durable. I always make sure to keep it pushed back on the counter to avoid accidents, but I have bumped it and dropped it once and it is holding up well. I have had good luck with this machine so far and I hope that it lasts a while because I am a fan of being able to actually brew a large carafe of tea without transferring several cups into a pitcher to get what I want. My husband and I are home at completely different times of day and prefer to have our coffee at different times. It was so wasteful to brew a whole pot, and then let it sit and go to waste, as reheated coffee tastes pretty terrible. I tried simply brewing less but always ended up either making it too strong or too weak or burning the coffee altogether. I got the Hamilton Beach The Scoop Single-Serve Coffeemaker for us for Christmas and have absolutely loved it. It's basically foolproof. What I love the most is that there is no carafe to potentially break (my husband has broken too many to count). I can make my cup of coffee as strong as I'd like using which ever beans I'd like, whenever I'd like, and my husband can do the same...any time of day (or night). The machine has a sleek stainless steel looks that fits with our kitchen decor and doesn't take up too much space on our countertop. I was nervous about using The Scoop when we had guests, such as family and friends. It turned out to be perfect for hosting and holidays since everyone wanted something different. My mom only drinks flavored coffees, my dad only drinks decaf. My husband's parents drink coffee all hours of the day and night. When I originally purcahsed the Hamilton beach the scoop single coffee maker, it was not my first choice. However, it was inexpensive and I figured it was only being used by me so I didn't have to brew a whole pot of coffee for myself. I bought it and set it up to give it a try. When I first turned it on and it started brewing, it looked extremely dark for the amount of coffee I put in. It also wasn't as fast as I thought it would be. However, I tasted the first cup and it was awful. I tried it again and used a different coffee and more water. I don't know if it was just my coffee maker, but I could not get a regular sized cup of coffee out of it. It was either making coffee that tasted like mud or I was getting a half of a cup of coffee. 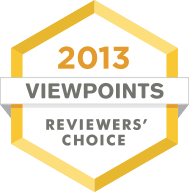 It was so frustrating and I didn't understand because other reviews I read said it was good. I returned it, but didn't end up getting another one. I didn't want to go through it again if they could all be like that. I would not recommend this for a single cup coffee maker. I would have given a ten if the price wasn't so high. Overall it was relatively easy to use. I recommend you read the directions first. My hubby didn't realize the unit's shelf was adjustable for the height of the cup you are using. Additionally, he made an error with the scoop and filter. Coffee grinds were all over and hot coffee was splashing all over the counter. Once we got past that, this Hamilton Beach coffee maker worked fine despite user error. It's obviously easy to clean due to its size. You have to play with the coffee scoops to get the strength you prefer. However, one has to do this with any coffee maker. I bought it because some visiting guests wanted decaf along with the 12 cup caffeinated pot for everyone else. I thought this would be easier. However I washed two units anyway and we ended up using a thermos to hold the extra caffeinated coffee. This freed up the main pot anyway. After weighing the cost against how much use it would get, I returned it. Perhaps if it was half the price I might have considered keeping it. For now I will stick with my 12 cup coffee maker and just make smaller cups as needed. I was looking for a single serve coffee maker that was small enough to keep in my office at work. I like to make coffee throughout the day, but did not want to make a full pot as it tends to get stale. I bought this coffee maker and it has been perfect for work. It is small and compact and makes a great cup of coffee. The coffee brews fast and is very hot. It makes a 16 ounce cup of coffee and does not taste watered down. I only use one scoop of coffee grounds and it is just enough. 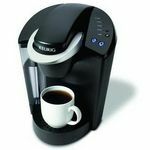 This is a great compact coffee maker that is perfect for small spaces and offices. Brew Performance The brew performance is perfect, it brews the coffee fast and is the perfect temperature. 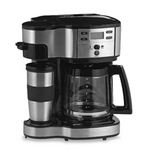 Ease of Use The controls on this coffee maker are easy to understand and very user friendly. 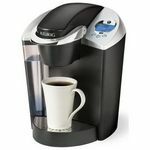 Design The design is great for a single serve coffee maker, it is small and compact and perfect for small spaces. Durability I have had this machine for over 6 months and use it at least twice a day and have never had any issues with it. I purchased the Hamilton Beach The Scoop Single-Serve Coffeemaker for my office that is adjacent to my classroom. I absolutely love this small kitchen appliance. I drink most of my coffee at home, but I do enjoy having a cup of coffee at work every now and then. 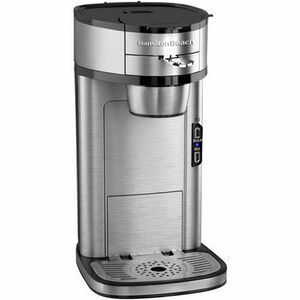 The Hamilton Beach The Scoop Single-Serve Coffeemaker is a great money saver because I am not tempted to go out and purchase a cup of coffee from the local coffee shop. I am able to scoop my coffee grounds, pour the water into the coffee maker, and have a freshly brewed cup of coffee in a couple of minutes. I like that I do not have to purchase filters for this coffee maker. 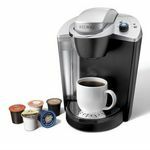 The Hamilton Beach The Scoop Single-Serve Coffeemaker is a small, efficient kitchen appliance and it is a great addition to my office. I like that I do not have to brew a whole pot of coffee. The coffee tastes great and it is a wonderful little time and money saver! Brew Performance The coffee I make using the Hamilton Beach The Scoop Single-Serve Coffeemaker is outstanding and tastes great!